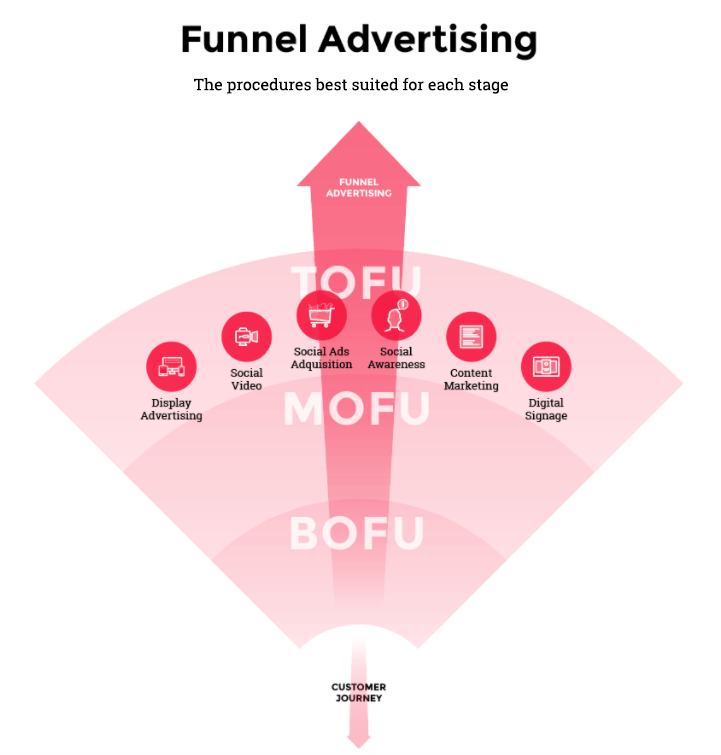 The TOFU stage, within the Funnel Advertising Methodology, acts as the moment where we try to get users to get to know us. We inform them of who we are and how we can be of service to them. How can we help fix their problems? What answers could we offer them regarding their needs? In this stage, our goal shifts from trying to close the deal or make the conversion to informing and enticing the consumer. Display Advertising. Display advertising, or “banner advertising”, visually transmits commercial messages by way of texts, logos, images, videos, etc... and are easily identifiable ads found on third-party websites. These ads are reserved for paid advertising and are specially designed and displayed in certain locations throughout a website. Often, these fields are found in the heading of website. Social Videos. Social videos are created to serve a specific marketing purpose. They are designed and made with the objective to simply be seen and to be shared on social media. The goal of these videos is to get users talking and, hopefully, involved as well. Social Ads Acquisition. When referring to acquisition in terms of Social Ads, we are talking about those cases in which we acquire a new audience via possible interests and consumer trends. We will find this strategy in the Top or Middle parts of the funnel, depending on the audience reach with which we are working. Social Awareness. This refers to a company’s digital presence on different social medias. The objective here is to make consumers more aware our company’s existence; who we are and what we represent. Content Marketing. Content ads are a more subtle way of marketing. The main objective of this type of content is to provide users with relevant and high quality information. Instead of directly offering a product, we are educating users by providing them with the necessary information they could use to help fix their problems and/or satisfy their needs. Digital Signage. This is the use of marketing content or digital advertising shown on LCD screens, plasma screens, LED panels or projectors installed in public places and other places open to the public (e.g. stores, sporting events, Times Square, busses, subways, etc.). These advertisements are displayed with the intent to entertain or inform consumers about the existence of a company’s product.